It is with sadness we report on the passing of a dear friend and colleague. Bonnie Christensen died January 12 at the Vermont Respite House of ovarian cancer, just shy of her 64th birthday. Bonnie inspired us with her wit and love of life and her dedication to her craft. 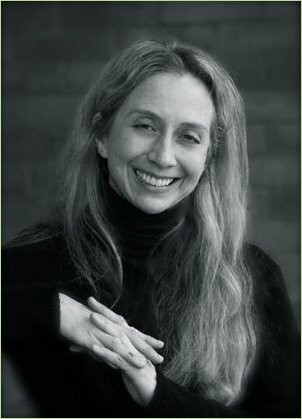 As booksellers we admired her artistic skills, appreciated her storytelling talents, looked forward to hosting her book events, and enjoyed selling her books that covered a wide expanse of subjects from Django Reinhardt to Andy Warhol to Nellie Bly. She was a true believer in our indie bookstore and shared our vision of an independent life. More importantly, Bonnie was a steadfast and wonderful friend. Mike and I had a lovely visit with her and her daughter Emily in Venice in 2001. We were grateful for our friendship and the opportunity she gave us to share her books, her art, her grand sense of fun, and her unique views on life’s vagaries. We will miss Bonnie dearly. A memorial service is planned for March 21 at the All Soul’s Interfaith Gathering. A huge thank you to our local communities for your food donations this season! 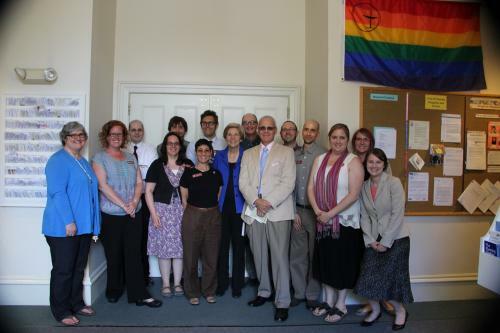 With your help we met our goals in both the Burlington and Essex stores, and we recently sent off two checks for $2,500 each to both the Chittenden Emergency Food Shelf and the Essex-Jericho-Underhill Ecumenical Food Shelf. 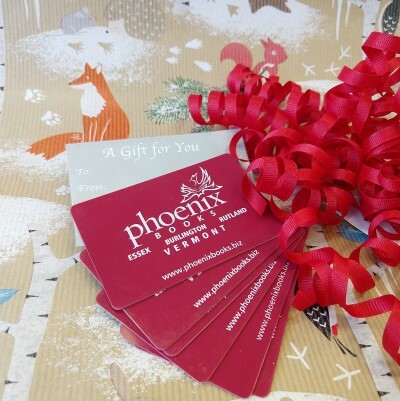 Phoenix Books Burlington staff members. Phoenix Books Owner, Michael DeSanto, and Food Shelf Development Director, Sophia Morton. Staff and volunteers at Essex-Jericho-Underhill Ecumenical Food Shelf. DeSanto said he and his wife and partner, Renee Reiner, were quietly considering a third Vermont location when Green Mountain Power Vice President Steve Costello contacted them. 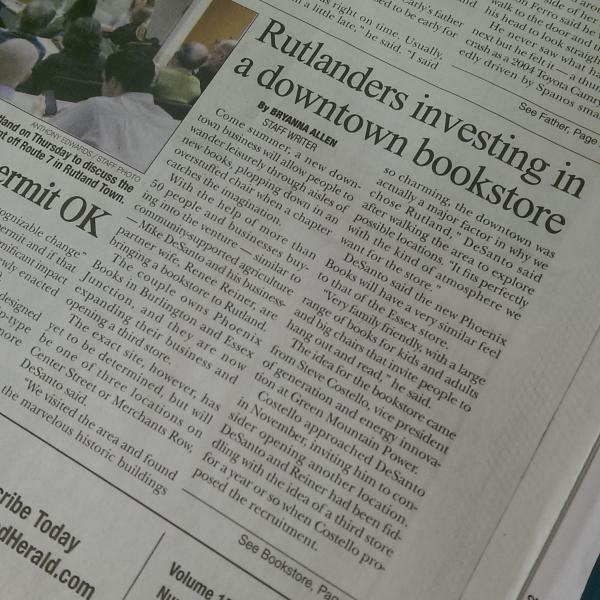 GMP, which also helped recruit Small Dog Electronics, NRG Residential Solar, SunCommon and groSolar to Rutland, has worked closely with the Downtown Rutland Partnership and other local leaders to recruit the bookseller. Phoenix’s model, known as community-supported enterprise, is much like a farm CSA, in that friends and supporters pre-buy books or invest in the business to help fund startup costs. GMP has enlisted more than 50 local businesses and residents who have pledged to pre-buy $1,000 worth of books each. “As we started that outreach, it quickly became clear that there was enormous demand for a local bookstore focused on new books, e-books and the like – a real hunger for an alternative to the Internet,” Costello said. DeSanto, who said he was looking for more local residents interested in pre-buying books or becoming minority investors, has narrowed the search to a handful of properties on Center Street and Merchants Row. To learn more about Phoenix Books, pre-buys and investment opportunities email DeSanto at michael@phoenixbooks.biz. 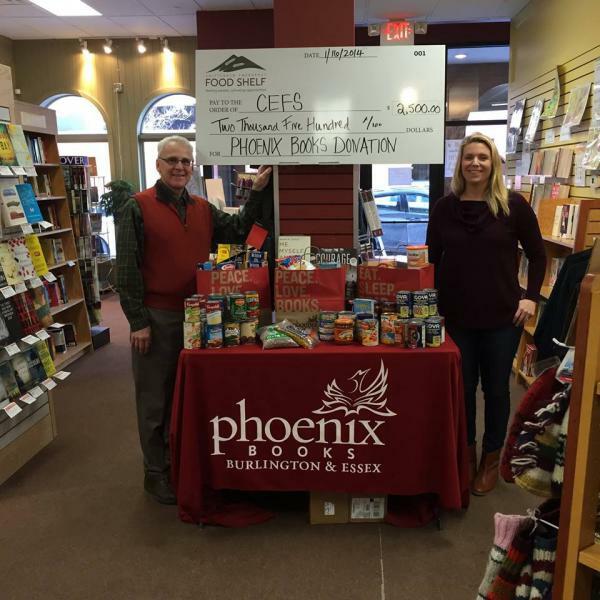 The owner of Phoenix Books is issuing a challenge to the community to donate nonperishable food items for local community food shelves. Mike DeSanto has pledged to make a cash donation equal to the value of food donated to the bookstore's food drive, up to $5000. 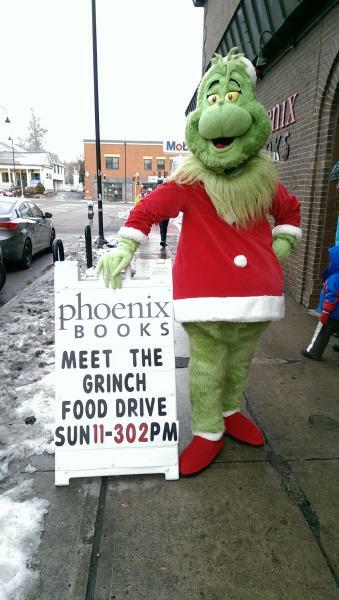 The food drive launched on Sunday, November 30th with "Meet the Grinch" events at both Phoenix Books locations. 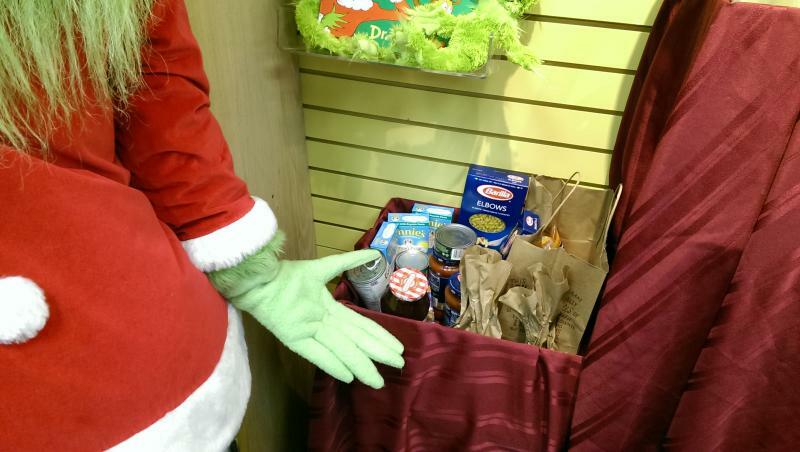 Attendees were invited to "grow your heart three sizes" by participating in the food drive. 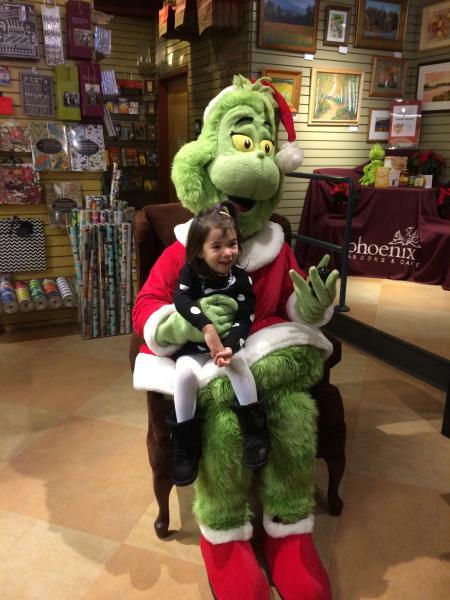 It will continue at Phoenix Books Essex and Phoenix Books Burlington through December 22nd, 2014. 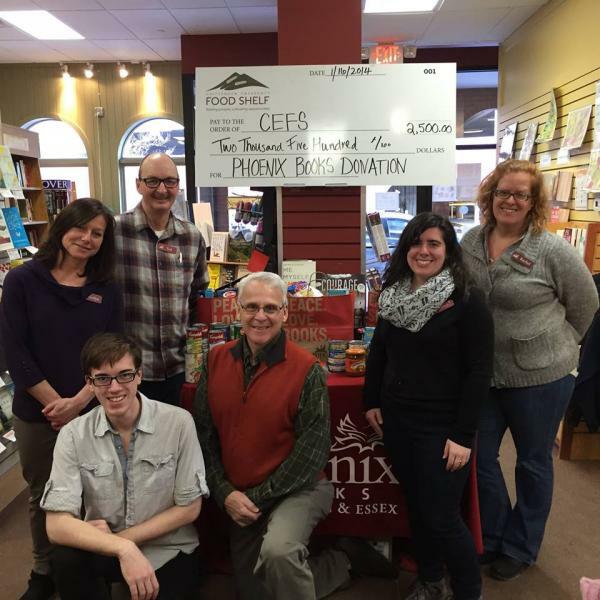 Phoenix booksellers are ready to help anyone who would like to make a nonperishable food donation. "I challenge our Phoenix Books customers to help me donate $5000 to the food shelves," DeSanto says. "Personally, I've become convinced that hunger has to be taken care of first, before people can succeed in raising themselves up in other areas." DeSanto adds that hunger has become a core cause that he wants to address both personally and through Phoenix Books in coming years. "Phoenix Books is hosting the food drive, my staff is supporting this effort, and I'm going to make a personal donation to the food shelf to equal the value of the food brought in. I really hope that I have to write a check for $5000. I would feel really good if that happened." The National Education Association reports that missing meals and experiencing hunger impair children’s development and achievement. Studies published in the American Journal of Clinical Nutrition, Pediatrics, and the Journal of the American Academy of Child and Adolescent Psychiatry document the negative effects of hunger on children’s academic performance and behavior in school. Hungry children have lower math scores. They are also are more likely to repeat a grade, come to school late, or miss it entirely. Phoenix Books has a long tradition of supporting local nonprofit programs of all kinds. This tradition is exemplified by the summer 2014 program Phoenix Books for Kids, through which the bookstore gave away $5000 worth of hand-selected books to children throughout the Burlington area, including many from low-income households. Phoenix Books Burlington is located at 191 Bank Street in downtown Burlington, Vermont. Phoenix Books Essex is located at 21 Essex Way, #407 in Essex, Vermont. 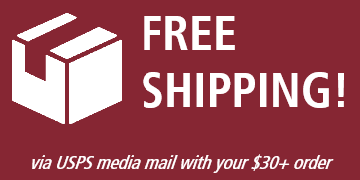 For more information, please call 802-448-3350 in Burlington, 802-872-7111 in Essex, or visit www.phoenixbooks.biz. Books for Children Gift Campaign, continues through December 10th. Share the joy of reading! The Fletcher Free Library and Phoenix Books invite community members to participate in the 24th Annual "Books for Children Gift Campaign," which provides Burlington preschoolers with new, quality books during the holiday season. 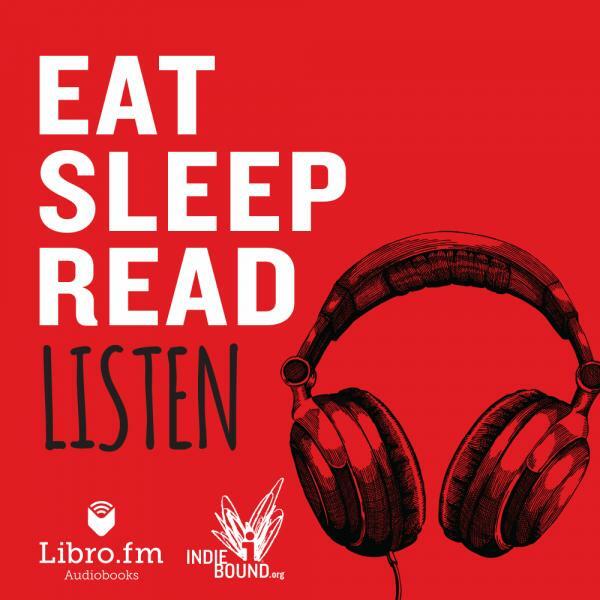 Please stop by Phoenix Books Burlington for more information. Please deliver the books to the library by Wednesday, December 10th. The Fletcher Free Library is pleased to partner with the Vermont Children's Trust Foundation's "Polar Express" adventure for this campaign. The future looks good with readers like these growing up with great books! Thank you to Ann Hughes for sending this photo of some of our favorite customers. A happy Thanksgiving to all of our community members from Phoenix Books. "What we are witnessing with Amazon v. Hachette is not a battle for lower e-book prices for the good of readers. We are witnessing the corruption of power, where almost having it all isn't the same, or as satisfying, as having it all. We are seeing how the desire for complete control will allow someone to set conscience aside while the lives and careers of others are toyed with like chess pieces, all while telling the world with a straight face that this power-move is for the good of us all." On Monday, July 7th, we helped Chris Bohjalian start off his Rock & Roll Book Tour with a bang! Over 300 fans packed the Fletcher Free Library to help celebrate the release of his newest book: Close Your Eyes, Hold Hands - a fictional tale about a homeless teen living right here in Burlington. There were readings, an interview by Stephen P. Kiernan, t-shirt giveaways and a drawing to have your name featured in Chris's next book. Thank you to everyone involved. We had a great time and can't wait for the next Rock & Roll Book Tour! On Friday, June 20th at 3:30pm, Phoenix Books welcomed Massachusetts Senator Elizabeth Warren for a discussion of her bestselling memoir A Fighting Chance. 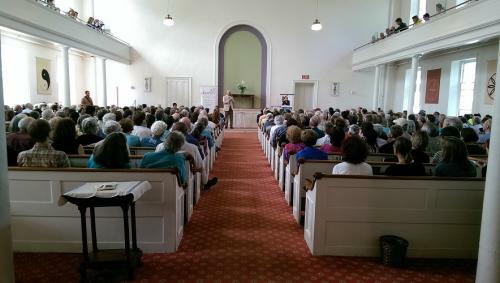 The event took place at the First Unitarian Universalist Society Meeting House in Burlington, and filled the 500-seat venue. Warren discussed her book and answered audience questions. "The Senator was simply inspiring," says Kari Meutsch, Phoenix Books' assistant manager. "She's genuinely fighting for all of us, and her charisma makes those who hear her message want to stand alongside her." "The totality of the event was exhilarating to see and to be part of," adds Phoenix's co-owner, Mike DeSanto. "This is the single largest author event Renee [Reiner] and I have done as bookstore owners." The event has been featured on WCAX and in the Burlington Free Press. Elizabeth Warren is the senior senator from Massachusetts. A former Harvard Law School professor, she is the author of eight books, including All Your Worth: The Ultimate Lifetime Money Plan and The Two-Income Trap: Why Middle-Class Mothers and Fathers Are Going Broke, written with her daughter, Amelia Tyagi. A Fighting Chance is her most recent title. In A Fighting Chance, Warren shows why she has chosen to fight tooth and nail for the middle class—and why she has become a hero to all those who believe that America’s government can and must do better for working families. The unlikely political star tells the inspiring story of the two-decade journey that taught her how Washington really works—and really doesn’t. Photos by Kristian Preylowski and Kari Meutsch. Visit our Facebook page for more images from this event.